The Willamette Valley, Oregon's leading wine region, has two-thirds of the state's wineries and vineyards and is home to more than 500 wineries. 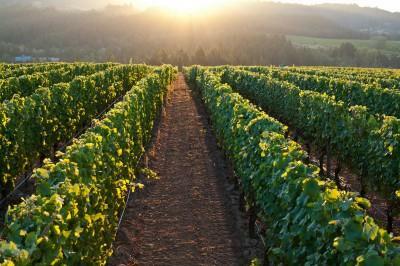 It is recognized as one of the premier Pinot noir producing areas in the world. Buffered from Pacific storms on the west by the Coast Range, the valley follows the Willamette River north to south for more than a hundred miles from the Columbia River near Portland to just south of Eugene. To the east, the Cascade Range draws the boundary between the Willamette Valley's misty, cool climate and the drier, more extreme climate of eastern Oregon. "This cool climate varietal is straw in color, the wine offers vibrant aromatics of melon, pear, golden apple, and floral blossoms. A rich mouthfeel reveals lush flavors of grapefruit, tangerine, lychee, and honey that continue through to the satisfyingly long and balanced finish." Savory cherry aromas open to deep, well-knit dark plum, smoky herb and spice flavors that linger toward refined tannins. "This semi-sweet Riesling is a cool climate varietal grown in the Willamette Valley region of Oregon. This Riesling opens with luscious aromas of citrus and tropical fruits. The mouthfeel is juicy with bright acidity that activates the palate and displays flavors of peach, pineapple and honeysuckle. Wine Enthusiast 91"Rich and ripe to the point of tropical, this bursts with lush citrus, peach, banana and papaya notes—a fruit salad of fresh flavors. It offers more than just ebullient fruit, though; excellent structure, balancing acidity and a nice long finish complete the picture." " This semi-sweet wine opens with luscious aromas of citrus and tropical fruits.The mouthfeel is juicy with bright acidity that activates the palate and displays flavors of peach, pineapple and honeysuckle. The finish is wonderfully persistent with balance of sweetness and refreshing crispness. This semi-sweet wine opens with luscious aromas of citrus and tropical fruits. The mouthfeel is juicy with bright acidity that activates the palate and displays flavors of peach, pineapple and honeysuckle. The finish is wonderfully persistent with balance of sweetness and refreshing crispness.